Philosophy Now has published yet another intro to Epicurean philosophy that confuses the end (pleasant living) for sedation or painlessness (disguised as ataraxia, which is a condition that leads to pleasant living). The article is titled The Ultimate Tranquilizer, and has prompted a strong reaction in defense of pleasure by some Epicureans (see this post in the Epicurean Friends forum). Also, read The Return to Lucretius II, and the last two parts of Andrew James Brown’s Epicurean reflections–on friendship and on the Garden’s community. And one of our members brought up a video titled The Case Against the Jedi Order, which critiques what Nietzsche called “the self-tyranny of the Stoics” and discusses how it tore apart the Jedi Order. Aeon Magazine published a piece arguing that religion is about emotion regulation, and encourages atheists and humanists to see religion as the product of evolution and as fulfilling a role different from that of science. The piece–and its requirement that we separate religion’s utility from its dangers–reminded me Raoul Vaneigem’s brilliant book On the Inhumanity of Religion, which seems to indict religion as an absolute evil, but in actuality what it does is point the finger at innocent, primitive spirituality as a form of play that was later coopted and corrupted by the powerful. Religious play is actually an established practice in Hinduism, where it is known as lila. Lila is the game that deity plays, or the participatory game that we play when we engage in religious activity or tell religious stories. Lila is used to describe true religious experience as blissful, joyful. It is also used cosmologically, where the ultimate nature of reality is described as spontaneous and playful. For instance, the love story between Krishna and Radha–which is meant to model the love between deity and devotee–is a lila, or a game of love. When Krishna dances with Radha and the gopis (cow-girls) in Vrindavan, this is called rasa lila. The divine epic of Ramayana is understood as a divine theatrical play as well, one that depicts the eternal relationship between deity (Lord Rama, a divine incarnation who acts as hero and savior) and devotee (Sita, his wife who is stolen away by a demonic King). All the relations in the epic are characterized by all the complexities of any relationship: youthful discovery, longing of lovers, loyalty between brothers, familial treachery, yearning, mutual responsibilities, friendship, loss, redemption, etc. And so it is a vast contemplation on how to relate to others. Then there is the cult of the infant Krishna–an avatar, or incarnation of God–which uses deities that are often treated as dolls by children. 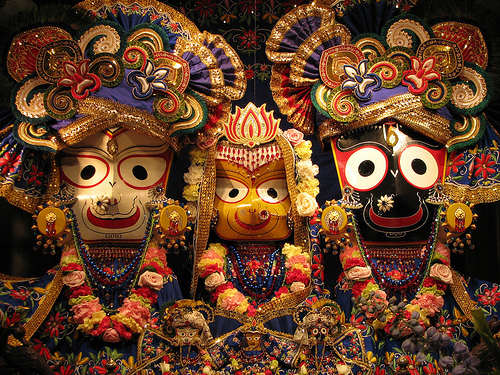 Hindu children worship the infant Krishna in his form of Jagannatha together with his sister Subhadra and his brother Balaram. They learn stories of how the three divine siblings played in Vrindavan, participate in their games, and lead the chariot with the deities in procession with a cord. All of these activities look and feel like children playing, but they are pious activities through which children learn to associate playfully with Sri Krishna. Imagine if there was a similar Christmas tradition of children going into a stylized manger and playing hide-and-seek and other games with baby Jesus, and you get the idea. Lila … demonstrate(s a) positive relationship to religion. Not the man who denies the gods worshipped by the multitude, but he who affirms of the gods what the multitude believes about them is truly impious, for the utterances of the multitude about the gods are not true preconceptions but false assumptions. This entry was posted in religion and tagged game, lila, piety, play, religion. Bookmark the permalink.